A budget solution that feels anything but inexpensive. Great performance at an excellent price. We’re not short of options when it comes to recording guitar, but a well-stocked and easy-to-use solution is still the most important link between having an idea and getting it down. 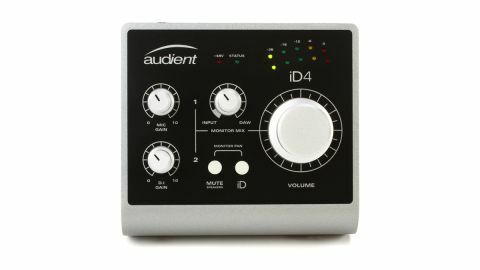 Step forward the Audient iD4, a powerful USB interface from the UK company which made its name from pro studio consoles. The iD4 is a simple two-input/two-output offering featuring a mic preamp - complete with phantom power for using condenser mics - as well as an instrument level DI for plugging in your guitar or bass. On top of this, there’s a main output for your speakers and dual headphone outputs. The whole thing is powered via USB, and with Apple’s camera connection kit, it can also work with an iPhone/iPad. However, the studio devilry is in the detail, and it shows that Audient has really thought about everything with value and usability in mind. From the fact that the mic preamp is the same design as those used Audient’s top-line desks, to the all-metal body (rare at this price), to the flexible metering (displaying levels for whichever control you turn), to the fact that there are two sizes of headphone jack (so you can use any headphones, or two people can listen at once). Finally, there’s the iD control, which acts as a self-assigning controller for your on-screen knobs and faders. With so many interfaces and ways of recording available, it’s hard to stand out and even harder for buyers to make a decision. But Audient has done it, while making a budget solution feel anything but inexpensive. The best we’ve seen at this price for a long time.